The countdown is progressing smoothly today for the launch of Orbital Sciences Corp.’s Antares rocket, with the Cygnus cargo spacecraft on top. There are no technical concerns with the rocket or spacecraft being worked. The weather for this evening’s launch is predicted to be 97 percent favorable. Liftoff is scheduled for 6:22 p.m. EDT from the Mid-Atlantic Spaceport’s Pad 0A at NASA’s Wallops Flight Facility in Virginia. Cygnus is loaded with about 5,000 pounds of science investigations, food, supplies and hardware for the space station and its crew. A launch this evening will result in Cygnus catching up to the space station on Sunday, Nov. 2. Cygnus will be grappled at approximately 4:58 a.m. by NASA crew members Reid Wiseman and Barry “Butch” Wilmore. Cygnus will be attached to the Earth-facing port of the station’s Harmony node and will remain in place approximately one month. It is scheduled depart the space station on Dec. 3. This is Orbital’s third mission to the International Space Station under its Commercial Resupply Services contract with NASA. 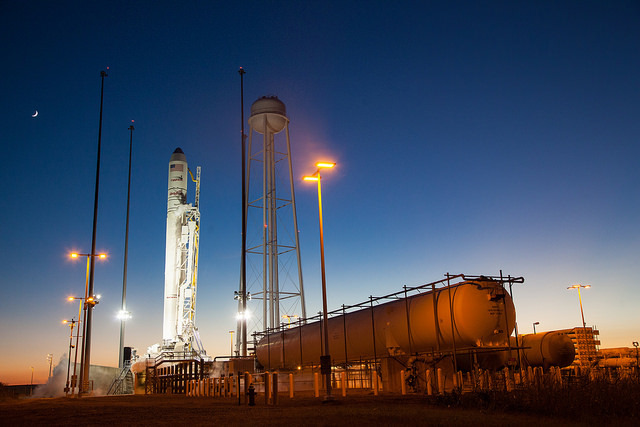 At a Launch Readiness Review Sunday, managers for Orbital Sciences Corp. of Dulles, Virginia, and NASA gave a “go” to proceed toward the Monday, Oct. 27 launch of the Orbital CRS-3 cargo resupply mission to the International Space Station. Orbital is targeting a 6:45 p.m. EDT launch from the Mid-Atlantic Regional Spaceport Pad 0A at NASA’s Wallops Flight Facility in Virginia. NASA Television coverage of the launch will begin at 5:45 p.m. There is a 98 percent chance of favorable weather at the time of launch. For more information about the mission, visit: https://www.nasa.gov/orbital and https://www.nasa.gov/station. ISS023-E-026925 (22 April 2010) — The unpiloted ISS Progress 35 supply vehicle departs from the International Space Station’s Pirs Docking Compartment on April 22, 2010. Filled with trash and discarded items, the Progress will be used for scientific experiments until it is deorbited and burned up in Earth’s atmosphere. Its departure clears the way for the ISS Progress 37 cargo ship that is scheduled to launch to the station April 28. The Russian Progress 56 cargo spacecraft separated from the International Space Station at 1:38 a.m. EDT Monday. The cargo ship has successfully completed its first engine fire to move away from the space station. Once it is further away, the cargo ship will undergo three weeks of engineering tests by Russian flight controllers before its scheduled deorbiting Nov. 19 to burn up in the Earth’s atmosphere. The departure of 56P clears the Pirs docking compartment for the arrival of the new Progress 57 resupply spacecraft. It is scheduled to launch at 3:09 a.m. (1:09 p.m. Kazakhstan time) Wednesday, Oct. 29, from the Baikonur Cosmodrome in Kazakhstan. NASA TV coverage of the launch begins at 2:45 a.m. The Progress will carry with it almost three tons of food, fuel and supplies the station and the Expedition 41 crew. Progress 57 will make its four-orbit, six-hour trip to the orbital laboratory and dock at 9:09 a.m. The highway traffic to and from the International Space Station gets busy Saturday and the six crew members of Expedition 41 are working feverishly to manage the traffic flow. Final packing of the commercial Space Exploration Technologies Corp (SpaceX) Dragon was completed and the hatch closed ahead of Saturday’s unberthing and departure. Release is planned for 9:56 a.m. EDT and splashdown in the Pacific Ocean west of Baja California is scheduled for about 3:30 p.m. 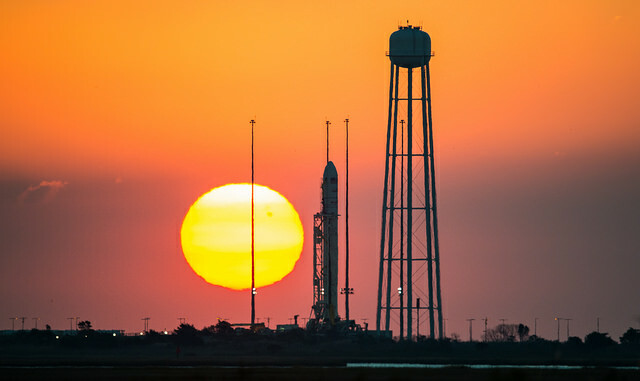 While the crew completed packing of experiment samples and equipment aboard Dragon for return to Earth, at NASA’s Wallops Flight Facility off the coast of Virginia, another commercial rocket – Orbital Sciences Corp.’s Antares with its Cygnus cargo craft – was rolled to the launch pad for final preparations leading to launch at 6:45 p.m. Monday. Plans are for Cygnus arrival at the station Sunday, Nov. 2, with berthing to the same Harmony module docking port that will be vacated by Dragon. 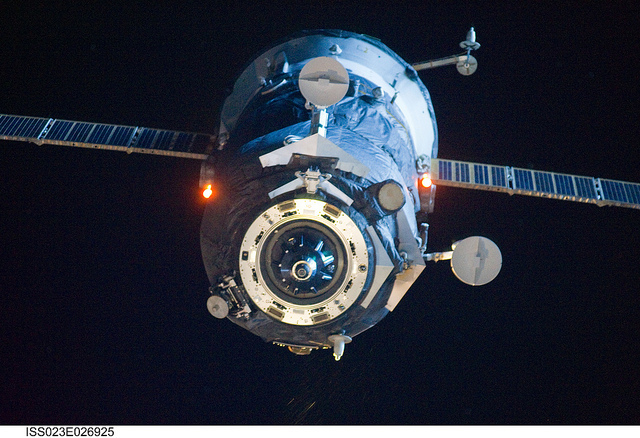 Two Russian cargo vehicles also will be making moves when Progress 56 undocks early Monday at 1:38 a.m., completing more than three months of service at the station. It will undergo several weeks of engineering tests by Russian flight controllers before being deorbited over the Pacific on Wednesday, Nov. 19. That departure frees the Pirs Docking Compartment for arrival of the next Russian cargo vehicle, Progress 57, which is set for launch at 3:09 a.m. Wednesday, Oct. 29, with docking to Pirs six hours later at 9:09 a.m.
Three of the crew members also are beginning preparations to return home after 165 days in space. Expedition 41 Commander Max Suraev and Flight Engineers Reid Wiseman and Alex Gerst will return home aboard their Soyuz TMA-13M spacecraft on the evening of Sunday, Nov. 9. That leaves the other three crew members to transition to Expedition 42, which will be led by Barry Wilmore. He will command the expedition that includes Alexander Samokutyaev and Elena Serova until next March. They’ll enjoy a Thanksgiving delivery of three more crew members – Anton Shkaplerov, Samantha Cristoforetti and Terry Virts – on Sunday, Nov. 23. Flight Engineer Barry Wilmore unpacks cargo Oct. 11 from the SpaceX CRS-4 Dragon commercial space freighter.